High-waisted, with turn-ups, darts or a flat front, casual or contemporary, elegant or for everyday wear? 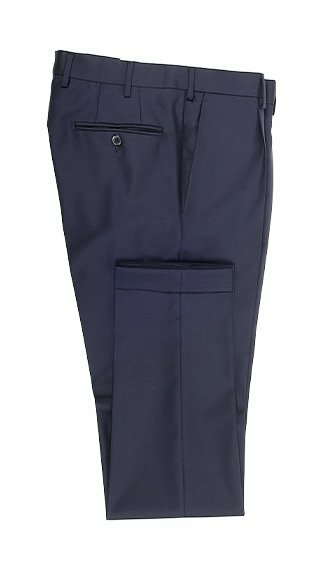 We have men's custom pants suitable for all and any occasion. 100% Italian sartorial details and a perfect fit: all that’s left for you to do is customise your made to measure trousers according to your style for a wardrobe that is truly unique and original. Made in Italy by skilled Italian craftsmen, Lanieri trousers are a traditional garment of the male wardrobe, reinterpreted for a modern man and according to the style of each individual. Read the guide and discover more about our men's tailored trousers. All of our custom-made trousers are lined to the knee, to reinforce the external fabric and enable easy movement when sitting down. To ensure a more thorough wash, the pocket bag is stitched externally to the lining. As small as it is indispensable. Often mistaken as a manufacturing error, the sartorial waistband split is a piece of sartorial foresight developed by tailors over the years and is indispensable to increase the level of comfort and wearability of the trousers, whilst also preventing tearing. This is one of those small details that really make the difference in terms of the longevity of a garment. The trouser hem binding is in fact a thin strip of fabric that is internally sown into the hem of our men's trousers, to prevent the fabric from wearing over time as it comes into contact with the shoe upper. Looking for a sustained well-defined line? The internal waistband extension has it covered! The button+hook fabric system sown internally into the front of our tailored trousers, precisely above the flap, keeps the fabric taught for an impeccable structure all day long. Belt loops are sown inside the waistband and reinforced by bar tacks. For suspenders, instead of loops, there are six internal buttons positioned on both front sides and at the centre of the rear.